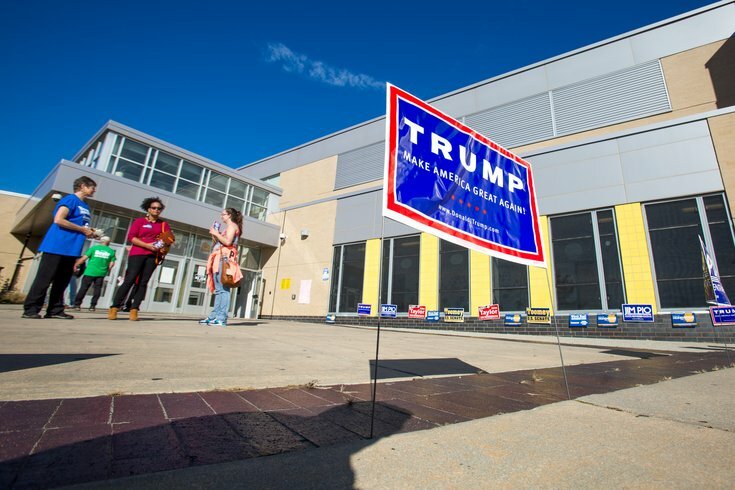 Signs supporting Republican presidential candidate Donald Trump were prevalent in many parts of Northeast Philadelphia, including at the Abraham Lincoln High School polling location on Tuesday, Nov. 8, 2016. Lines to vote backed up onto the sidewalks at many polling places on Tuesday in Philadelphia, with strong voter turnout reported for this year's presidential election. 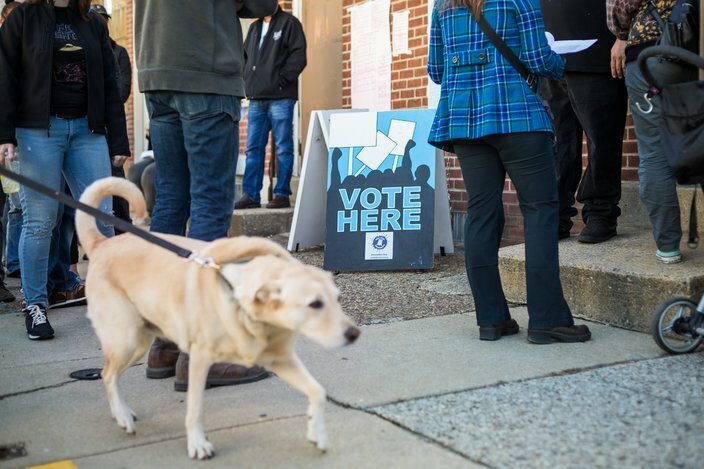 In Northeast Philadelphia, voter turnout was reported heavy in the city's 56th ward. Gil Segal, 75, a Rhawnhurst resident and committeeperson in the ward's 40th division, said voter turnout Tuesday was the highest he's seen in years. By 1:30 p.m., he said a third of the division's registered voters had cast ballots. "Voter turnout has been growing all day," he said. "Turnout for this time of day is even higher than it usually is." 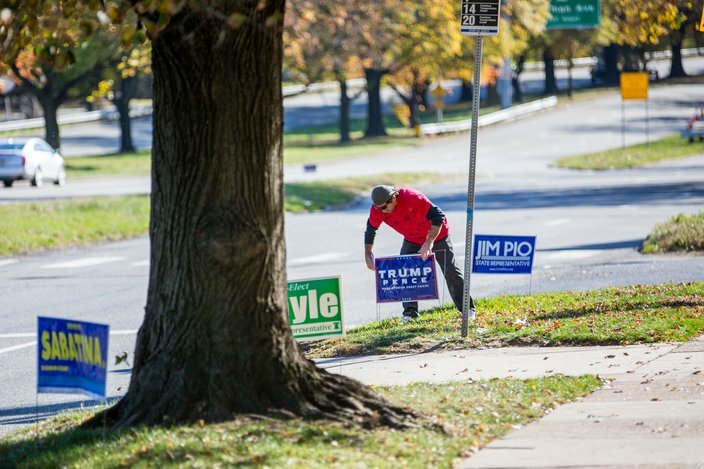 At a polling place at Valmont Towers, an apartment complex along Roosevelt Boulevard, Lori Donahue, 48 and her husband, Mike, 52, both Republican committee members from Rhawnhurst, spent the early afternoon installing Donald Trump political signs along the boulevard. Lori Donahue said people have been stealing Trump signs all morning. "They keep taking them," she said. "And, it's not just happening here. It's all over the city." At Abraham Lincoln High School at 3201 Ryan Ave. in Mayfair, where residents living within five voting districts — all in the 56th ward — came out to vote, voters on hand seemed excited for the possibility of a Clinton victory. Mike Donahue, committee person of the 56th Ward, 34th Division, replaces signs along Rosevelt Boulevard after claiming they've been stolen several times throughout the day. "I would have voted for either of them, if only the Republicans would have given me a candidate," said Connie Buck, 57, of Medina Park. Buck said she didn't lean in a political direction either way, but worried that a Trump presidency could hurt America's standing in global politics. "He scares me and, obviously, he scares the rest of the world," she said. For Hollister Knowlton, 68, of Chestnut Hill, Clinton was the only candidate on the ballot with the experience necessary to lead the country. "I think this is pretty exciting," she said. "I was a Bernie supporter, but Hillary is my second choice." Though she's a Democrat, Knowlton said she doesn't usually vote straight for her party's ticket. Yet, this year, she did. Some voters said they were still weighing their decisions heavily before casting their ballots. "I didn't feel strongly one way or the other coming in here," Linda Sanders, 67, of Bensalem, Bucks County, said Tuesday morning at her voting place along Bristol Pike. "I don't think any candidate is perfect." Sanders said she prided herself on being impartial throughout the election season, but once she was faced with a decision, Sanders ultimately voted for Clinton. "Now that it's over, I feel good," she said. Sonny Jenkins, 63, of Andalusia, Bucks County, intended to use his vote as a way to upset the established political system. "As a voter, I'm here to pull the plug on them," he said. Jenkins said he voted for Trump because he wanted to "get rid of all the corruption" in Washington, D.C. Even as Clinton has shown a healthy lead in early voting nationwide, Jenkins said Tuesday's results would show that the rest of the country supports Trump as well. As of 10:30AM around 230 Fishtown residents had cast their vote at 236 Richmond Street in Philadelphia, Tuesday, Nov. 8, 2016. "I think this is going to be a surprise," he said. In Port Richmond, 100 voters made it to a polling place at The River Wards Cafe along Richmond Street by 9 a.m. Karen Law, 47, a Democrat, said she wanted to make sure to show her support for Clinton, specifically because of the Republican candidate's comments about women. "Who does he think he is?" she asked of Trump. "He puts us, women, down. He called us fat and ugly. What about you? He should take that toupee off!" About 100 people voted by 9:30 a.m. at the R.W. Brown Community Center polling place on North 8th Street, near Temple University. There was only a short line for voters. But at 236 Richmond St. in Fishtown, a line of about 30 voters stretched out of the venue and down the block around 10:30 a.m. Already, nearly 230 people had voted at the location. Those waiting in line seemed excited to be able to vote — and that the election season was finally coming to an end. "This is exciting. This glass ceiling is finally getting shattered," said Jenna Miller, 37, of Fishtown. Miller said she typically is "middle-of-the-road" politically, but the chance to vote for, potentially, the first female president, had her excited to be a part of this historic election. Just behind her in line, Rich Symes, 41, of Fishtown, said he planned to vote for Trump. Symes said he was sick of corruption in Washington and ready for "a fresh person in there." 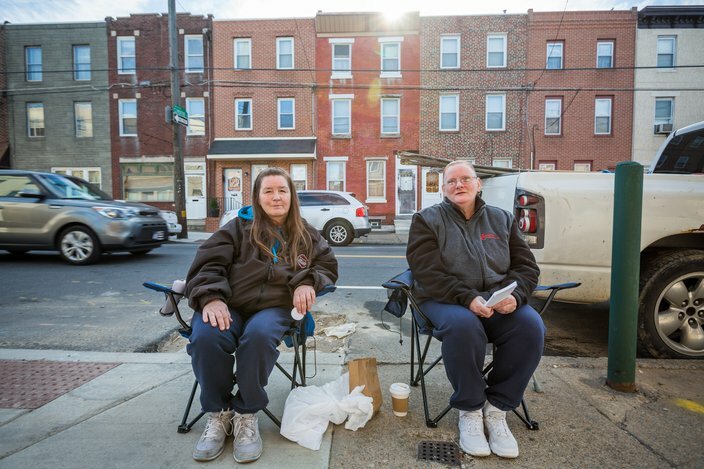 Supporters of the Demoratic Party, Michele Furness, 52, left, and Karen Law, 47, both of Port Richmond talk to voters ourside of the River Wards Cafe polling location, Tuesday, Nov. 8, 2016. "It's not even that I like the man. I just hate the corruption," Symes said. Back at Abraham Lincoln High School, one man pitched the idea of an alternative third party candidate to voters — Curly from the Three Stooges. "I hand these out just for laughs," said Joe Borejko, 62, of Philadelphia as he handed out signs reading "Curly for President." Smiling as he did his best Curly impression — complete with a "nyuk, nyuk, nyuk" — Borejko said he doesn't actually expect anyone to vote for the deceased stooge. "I actually voted for Hillary, this is just for fun," Borejko said.